Throughout January, we chronicled the positive climb Kentucky made on its way to Final-Four-contender status. A UK loss on Saturday at Florida would have been understandable. It was set up as a defensive matchup, plus the Gators were desperate for a marquee win -- and Kentucky has an inconsistent history in Gainesville. This pointed to a potential letdown for the Cats. But no: Kentucky 65, Florida 54. The Wildcats (18-3, 7-1) found a new way to win, coming back from a 42-31 deficit with less than 14 minutes remaining and ending the game on a suffocating 34-12 run. Florida (12-9, 4-3) was vexed. It's getting harder to discount this team's dynamism and its inventiveness. Though March will be the ultimate decider on what I'm about to write, I will say that this Kentucky team has a chance to be one of the three or four best John Calipari's ever had. The closing ability Calipari's club put on display was impressive. For almost three-fourths of the game it looked as though Florida was going to get a much-needed win to improve its stock. Mike White's team was beating Kentucky on the boards consistently early, turned UK over and kept Kentucky freshman Keldon Johnson in check. Something switched nearly halfway through the second half. PJ Washington -- who had the best game of any Kentucky player on Saturday -- finished with 15 points and 12 rebounds. Freshman Tyler Herro had a game-high 19 points and made three 3-pointers. Herro has developed a habit of hitting big shots in tight moments. If you were to pinpoint how Kentucky has grown as a team, Herro's progression over the past six weeks is the embodiment of that confidence. Even Johnson came to life late, giving Kentucky a cushion and finishing with points. The most striking thing about Kentucky's comeback victory was how this team wasn't capable of doing this in much of December. Now it's February and UK is pushing closer to Tennessee's status among the peaks of college hoops. 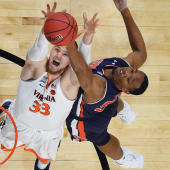 Defensively, it was like watching a team evolve and take yet another step in its progress to being one of the most stifling units in college basketball. Florida shot just 34.9 percent and only took 10 free throws (making just five). Of course, the Gators are far from elite on offense. But still, teams often take road losses in league play when they have off nights. This was an off night for Kentucky -- and it still won by 11. Kentucky baited the Gators into bad, panicky shots once the game was a toss-up with less than five minutes remaining. Calipari has to feel good about this one not just because his team's win streak is now at eight, but also getting the first win in Gainesville since 2016. The win in fact draws UK even in road games at Florida in Calipari's tenure. The Wildcats are 5-5, the lost total equaling Tennessee for the most losses in-league against any program in the past 10 seasons. Don't expect Kentucky to drift from its post any time soon. Five of its next seven games come at Rupp Arena. KenPom.com projects UK to win every regular season matchup the rest of the season with the exception of the road tilt against Tennessee on March 2. Game by game this Kentucky team is showing the rest of college basketball how it can win in different ways. It's not as flashy as Duke or as ironclad as Virginia, but since we got to 2019, Kentucky's played as consistently and impressively as either of those teams -- and pretty much everyone else.